It’s a strange experience, living in a place that is very well worn on the tourist trail. I’ve visited (and loved) New York, London, Paris, and have lived in some moderately well-known cities too (Hiroshima, Toronto). Once I started living in Toronto I rarely, if ever, did any of the tourist sites, and thought that things would be a bit different here in Kyoto, especially since I am now a serious photographer and this is a city that is quite photogenic. I’d been here before, of course, as a tourist, on several occasions. The first time was nearly 15 years ago, at the end of May in the year 2000. My friend and I had been dying to come here, and once we had arrived in the city we did our damnedest to see as many sites as we could. And despite Kyoto being famous for its regional cuisine, what really had us excited were the foreign food restaurants we could indulge in. Being foreign residents in a small city in a no-name prefecture meant that we had Japanese food by the truckload everyday, but try to get something different – Indian, Italian, etc. – we were out of luck unless we cooked it ourselves (if we could source the right ingredients for it). So we spent our days visiting temples and shrines and our evenings eatings pastas and curries. It didn’t take long, however, before we were templed-out, so decided to get ourselves made up as maiko-san. The novel, “Memories of Geisha” had been released a year or two earlier and we were big fans. The staff at the information office set us up with a business that catered to young women (Japanese and foreign) wanting to live the geisha dream, and before we knew it we were having thick white make-up applied to our faces and necks, choosing our kimonos, and hoping that one of the wigs would fit on our heads (I have a pretty big one, so it took some pushing to get one to go on). We spent an hour or two wandering the streets of Kyoto in our heavy make-up and kimono, and were often asked for photos by Japanese, curious as to these two foreign girls in very traditional garb. I don’t remember much about that particular first trip to Kyoto, but the day we got dressed up has always remained a strong memory for me, even after all these years. Maybe it’s that lack of memory that had me coming back time and again to Kyoto, revisiting the same places over and over. Did I really need another photo of Kinkakuji? Well, this is summer and the last time I was here it was spring…or so I would tell myself. And maybe I was right. Yet I live here now and I still do those same things, when I have the time to do them. I rarely go out and explore the city as a local would. I wonder what the pull is, dragging me back again and again (or even just one time) to those special places that everyone else wants to get to too. As I now live in Kyoto, I have the time to explore places that often get missed or overlooked by tourists, and I wish I would do that more. But like my time in Toronto, I rarely do. Life (i.e. work) often just gets in the way. But in the end, when you really look at it, that’s just an excuse. At this very moment I have a week off from work, a reprieve, and I woke up this morning knowing I should go somewhere interesting (I have some film to test), but every one of my favourite places just seemed boring to me. The bamboo grove (again). The shrine gates (again). Daigo-ji (again). Then I remember that there was something that I have always wanted to photograph, but never did. So instead of revisiting old Kyoto sites I went to Takatsuki, a major stop about halfway between Kyoto and Osaka. 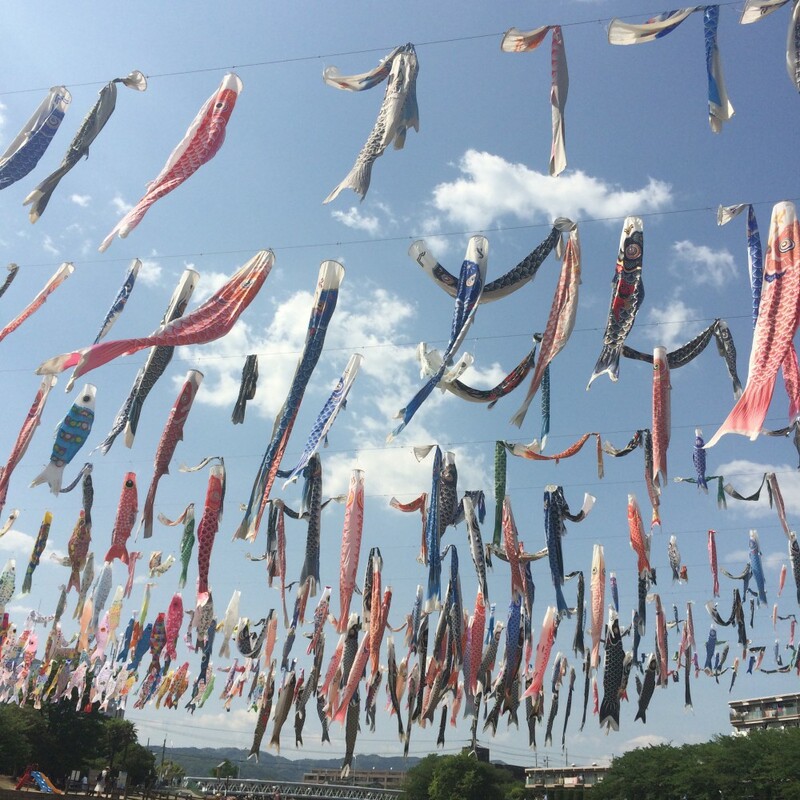 It’s just a regular Japanese city, but it’s Golden Week now, and they have hundreds of carp streamers, known as koinobori, flying in one of the local parks. When I got there it was packed full of older residents and parents with pre-school children. I felt a little self-conscious as a very obvious foreigner and a very obvious photographer (can’t be helped, I use a tripod), but one of the things I like about Japan is that most people don’t blink an eye to this kind of behaviour (pulling out a camera/tripod to photograph (not only) children in a park anywhere in North America? Good luck). So I spent a few good hours slowly burning my pale winter skin while I photographed the carp streamers hanging in the sky. Funnily enough, standing out in a crowd is not such a bad thing. A nice young Japanese woman came to talk to me, holding an old manual Minolta film camera in her hand. A nurse, a fellow Kyoto-ite, a film photographer. In a world of DSLRs, smartphones, Instagram, and other devices that can having us share our lives in an instant (with the appropriate old-timey film filter), finding someone who actually shoots film is a bit of a rarity. We talked for a while and then she took my picture. I’m not sure how well it will turn out, since I was red-faced and sweating from standing under a burning sun, but at least I was spared the indignity of having to see it because there was no LCD screen on her camera (another plus for film!). 😉 Let’s hope a few of my own photographs will turn out. What a nice bit of writing. I need to spend some more time in Kyoto, and I’ve not made it to Osaka yet. I just bookmarked your blog. Arigato gozaimasu.